It doesn’t get any easier than beef with salsa-raisin sauce for this spicy sandwich. 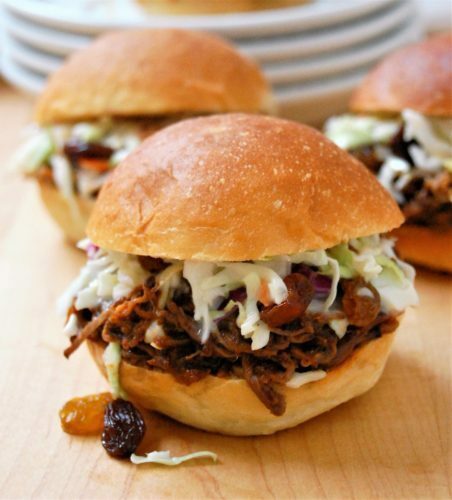 Let your slow cooker do the cooking, then pick up a bag of ready-cut coleslaw and soft dinner rolls or burger buns. You’ll be ready for Super Bowl Sunday or a simple meal any day! Tuck the shredded meat and some prepared coleslaw mix into purchased soft rolls. Dinner is ready and call it a day! COMBINE salsa and ¾ cup raisins in a blender or food processor. Whirl until smooth. PLACE meat in a slow-cooker. Pour sauce over to evenly coat meat. Cook 4 hours on high or 6-8 hours on low. Meat should be very soft and tender when done. REMOVE meat from cooker and place on a plate or cutting board. Shred with two forks. 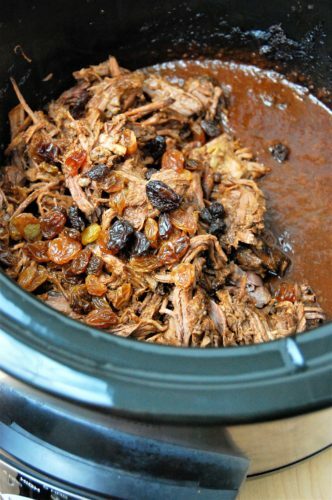 RETURN meat to slow cooker and stir in remaining ½ cup raisins. Serve immediately or keep warm until ready to serve. SPLIT rolls in half. Fill with meat and coleslaw.